Just think of all the new ways you'll die! "This is it," you said to yourself back in April. "One final time into the Dark Souls breach, and then I'm off the stuff for good." You did it all. You deciphered the obtuse lore. You gathered the most hard-to-reach items. You downed even the toughest of foes. You died, over and over and over, and at long last, you emerged from the misty land of Lothric, battered and scarred, but all the better for it. You were finally done. Then, Dark Souls 3's first DLC pack was announced. "Ashes of Ariandel" takes you back to the proverbial frontlines, which have shifted to the snowy land of... well, Ariandel. As is to be expected, you'll encounter new bosses, environments, weapons, armor, spells, and so on and so forth. 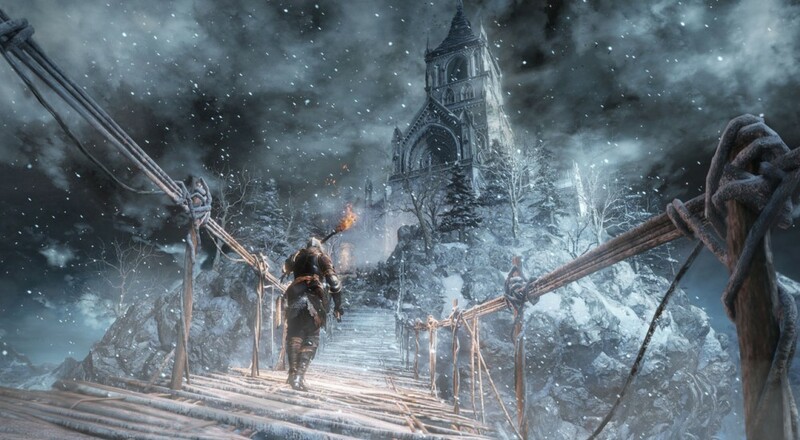 If Dark Souls 2's DLC packs were any indicator, "Ashes" will also be tough as effin' nails. Check out the new gameplay trailer below. The implements of your demise have a slightly more Nordic bent this time around, which is a welcome respite from the incredibly gorgeous, but occasionally repetitive, environments from the rest of the series. As you probably saw in the trailer, "Ashes" will be available on October 25th, just in time for Halloween. I can think of few activities more apt to the holiday spirit than sitting in a darkened bedroom, whimpering to myself and hoping that the terrifying monstrosity around the corner won't be the one that inevitably ends me.